Koordinator is the follow up project to the sucessful BMBF project landmarke in which research was directed towards the creation of an ad hoc wireless sensor network to improve firefighter navigation. In Koordinator it is now investigated how this navigation support network may be extended using novel pervasive technologies to improve mission control in the field. In an indoor firefighting mission, coordination and communication support are of the utmost importance. 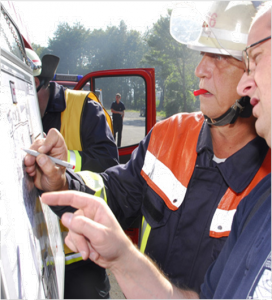 In contrast to some large scale emergency response research, Koordinator focuses on the front line interaction between teams of firefighters and the incident commander on a single site. In such a setting frequent technical failures and the high cognitive costs incurred by communicating impede coordination. Koordinator seeks to create a complementary firefighter support system which solves these issues. The key features of the new system are: a robust ad-hoc network, telemetry and text messaging, and firefighter activity recognition.